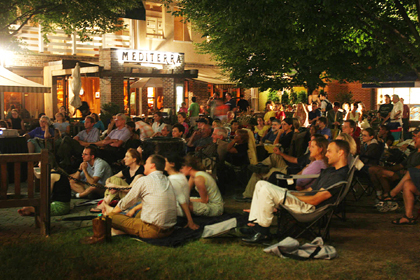 "HERE'S LOOKING AT YOU, KID": Bogart toasts Bergman with that line, one of the most quoted in Hollywood history, as a good-sized crowd looked on during the showing of "Casablanca" last Monday on the plaza in front of Mediterra. Princeton Borough and Township are currently involved in a two-and-a-half week "heightened alert" period targeting drunk drivers. A total of 54 new staff members have been hired and will assume their posts in the district with the start of school on September 8, according to the Princeton Regional Board of Education. A 27-year-old Princeton-born, Princeton-educated marine narrowly escaped death earlier this month in "the other war," the one in Afghanistan.